Evgeni Plushenko performs to “El Tango de Roxanne” from the “Moulin Rouge” soundtrack. The first medals of the 2012 Russian National Figure Skating Championships were decided in Men’s division. As expected, Evgeni Plushenko had no trouble with defending his overnight lead and won the ninth national title of his career. 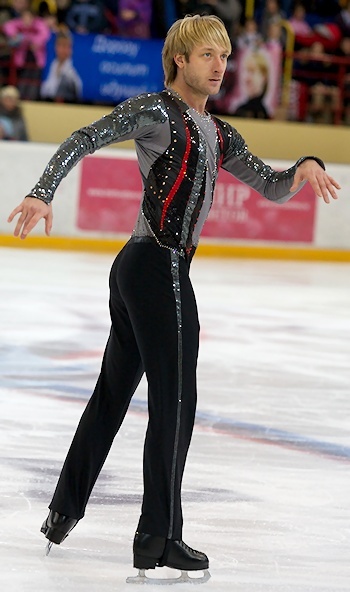 Artur Gachinski repeated his last season silver, while Sergei Voronov rose from fifth place to win the bronze. Skating to El Tango de Roxanne, Plushenko checked out his opening elements: quad toe loop, two triple Axels, and a triple loop, but ran out of stream in the second half of the program. He doubled his the first triple Lutz attempt and stepped out of the second one. The 2006 Olympic Champion mostly relied on his command over the attention of the audience as a means of interpretation, however, his skills in forging connection with spectators served him very well as the public responded loudly and enthusiastically to his every move. Though he posted only the third highest technical score of the evening, he won the long program with a five-point margin, scoring 171.43 points and 259.67 points overall. Speaking of his performance he once again, stressed how hard it was for him to skate here. At the same token, the 29-year-old does not plan to rest on laurels. The student of Alexei Mishin expressed gratitude to his fans who supported him here at the venue as well as for those who rooted for him online. The skater said that he is looking forward to the World Team Trophy planned for the end of this season. Plushenko, however, faces an unexpected challenge on his road to the ISU Championships: he does not have a minimal score which the ISU requires, and there are no competitions for Senior single skaters planned until the Europeans in the end of January. Gachinski, who drew the last starting number, fell on the opening quad toe loop attempt, but recovered to produce all other elements without a glitch. His program, set to the soundtracks of Dracula and Interview with Vampire, was more expressive and fluent than the ones he has had the past. However, while he posted the highest technical score of the night, he was not able to put serious pressure on Plushenko, and finished ten points behind him with a score of 166.06 (249.58 overall). Sergei Voronov delivered an almost flawless routine to Leoncavallo’s I Pagliacci featuring a quad toe loop and two triple Axels. The skater still does not attempt a triple Lutz, however, he added a triple flip back into his repertoire (even though he received an edge call on it). He received 164.44 points for the long program and 240.79 points overall. Ivan Bariev finished fourth in the long program with a passionate performance to The Phantom of the Opera in which his only mistake was stepping out of the opening triple Axel. The particular highlight of the routine was the explosive final choreographic step sequence. The 20-year-old earned 150.31 points for his effort and pulled up to sixth place overall (219.87). Konstantin Menshov delivered his typical hit-and-miss program, falling on the opening quad and later doubling a couple of easier triples. He slipped to seventh place overall (219.28) despite being sixth in the short and fifth in the long (145.09). Zhan Bush fell out of an underrotated quad toe loop in the first seconds of his routine to an unusual arrangement of Carmen, and later had several other errors to finish sixth in the long program (141.49) and fourth overall (223.30). Artur Dmitriev finished fifth (220.29) with a courageous performance in which he first doubled a planned triple Axel, but then was able to replace a planned double Axel with a triple one at the very end of the program (140.60). Denise Biellmann (SUI) popularized the “Biellmann spin“—an upright figure skating spin in which the skater executes a one-foot spin while holding the other foot extended over and behind the head.